En fin, I present the end result of my shredded pork and pumpkin endeavors. And if I do say so myself, this project has exceeded my expectations every step of the way. The shredded pork was moist, tender, and flavorful all by itself; the pumpkin was easy to prepare, and even the pumpkin seeds worked out. I am calling this a stew, even though I didn't really cook it the way I would cook a stew. It took many hours (but little work - most of the time is stove-top cooking time) to make the pork, and about 45 minutes to make the rest of the dish, which I did the following day. I chose the perfect size pumpkin - about three times the size of an acorn squash. It yielded approximately 4 cups. I used one each of three different kinds of potatoes I found at the green city market - yukon, purple, and some red one that had a red streak running throughout, which also yielded about 4 cups, so the two complemented each other perfectly and neither one overpowered. In the picture above you can easily distinguish between the two (there's one of each right at bottom center), but after a night in the refrigerator they absorbed more of the spice-darkened liquid and looked more alike, so it was harder to tell them apart. It made for a lovely surprise with each mouthful - I either got a smooth, dense texture with the potato or a light, fresh burst of pumpkin. Both were delicious and it gave the stew a depth of flavor and texture that kept it interesting from the first bite to the last. 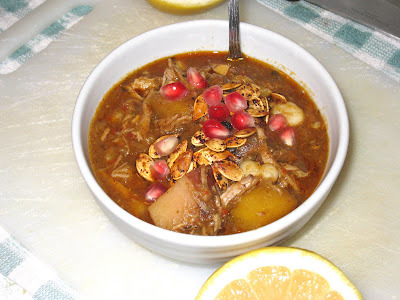 And like most stews, it got better every day as all of the flavors continued to blend together. It was the perfect dish to take to work for lunch. I was disappointed when I hit the bottom of the container. I hope the pumpkins are still around when I get back from Texas after Thanksgiving so I can make it again this season. Heat braising liquid over medium high heat until boiling. Add oregano, cumin, salt, pepper and potatoes. Lower heat and simmer for ten minutes. 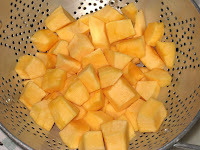 Add pumpkin and cook for 15-20 more minutes, until potatoes and pumpkin are tender and you can easily stick a knife inside them. Add pork and hominy and heat through. Serve immediately.